Shares of aircraft-manufacturing company Boeing took a hit early this week, losing $26.6 billion in market value Monday and Tuesday, following a deadly crash of one of its 737 Max 8 airplanes in Ethiopia. That model has since been grounded by the Federal Aviation Administration, as well as by aviation regulators around the world. 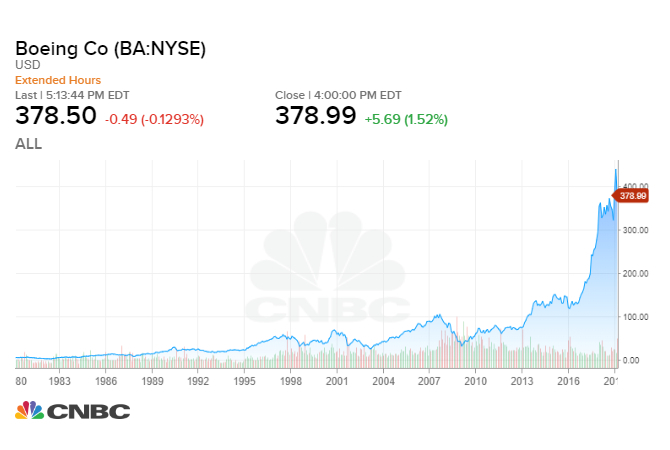 Still, if you invested in Boeing 10 years ago, that decision would have paid off: According to CNBC calculations, a $1,000 investment in 2009 would be worth more than $14,000 as of March 15, 2019, a total return over 1,000 percent. In the same time frame, by comparison, the S&P 500 was up 270 percent. Any individual stock can over- or under-perform, however, and past returns do not predict future results. Boeing paused delivery of 737 Max planes after the Ethiopia crash, which came less than five months after another deadly crash in Indonesia involving the same model. This left several major airlines, including United, American and Southwest scrambling to rebook passengers and reassign planes. Those companies said they would waive ticket-change fees and fare differences for those affected by the FAA's grounding order. Flight-booking site Kayak even introduced a new search feature that allows users to exclude specific plane models, according to co-founder and chief executive officer Steve Hafner. Fortunately for Boeing, while shares plunged more than 10 percent early this week, they ticked back up by as much as 3 percent Friday. And the company announced plans to roll out a software fix in the next few weeks. Though, Bank of America analyst Ronald Epstein said Thursday that the fix could take a lot longer: "Once Boeing identifies the issue … the most likely scenario is the company will take about 3-6 months to come up with and certify the fix," he said in a note. Hafner says he expects the 737 Max models to be grounded only a few months and that travelers will likely be booking flights on them again soon: "They're out of service on a temporary basis," he said on CNBC's "Squawk Alley." "In reality, airlines are still planning on flying those planes in the summer. People want security and comfort when they fly." In the meantime, Boeing said in a statement it will "continue to build 737 Max airplanes, while assessing how the situation, including potential capacity constraints, will impact our production system." If you're looking to get into investing, expert investors like Warren Buffett and Mark Cuban suggest you start with index funds, which hold every stock in an index, offer low turnover rates, attendant fees and tax bills. They also fluctuate with the market to eliminate the risk of picking individual stocks. Here's a snapshot of how the markets look now.